The volcanic mountain in this picture is Mayo Volcano on the island of Luzon in the Philippines. Mayon is a beautiful example of a stratovolcano . This is a model of the interior and exterior of a stratovolcano. The letters represent important terms that you need to know to understand how volcanoes are formed and how they work. 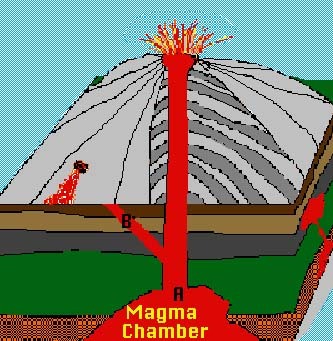 The letter A represents a magma chamber . Magma is molten rock that is located under the surface of the Earth. 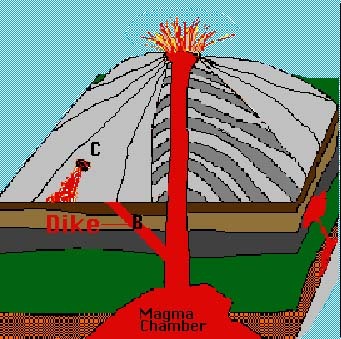 A magma chamber is usually located far beneath the surface of the Earth where an oceanic plate is driven down into the mantle by a continental plate. The oceanic plate melts as it desends into the upper layer of the mantle. Some ocean water gets trapped with the oceanic plate and is turned into steam by the intense heat. The magma is less dense and under extreme pressures that force it up toward the surface. This molten rock and gas collects in a magma chamber until it can escape to the surface. The letter B represents a Dike . Stratovolcanoes are built by many alternating eruptions of lava and ash . 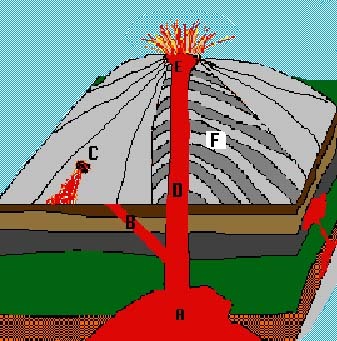 The magma below and inside the mountain exerts a lot of pressure on the crust and on the volcano itself. The magma pushes its way through small cracks in the crust and finally reaches the surface. This causes a dike to be produced. A dike is an intrusion of magma that cuts through layers of already existing rock. The letter C represents a Side vent . When the magma reaches the surface of the Earth it is then called lava. The lava leaving the side vent causes the volcano to add a layer of lava and usually a layer of ash with each eruption. These eruptions build the volcano higher and wider. Hawaii has volcanoes with many side vents that have built the islands with very wide bases. Some volcanoes on the other hand have few or no side vents. 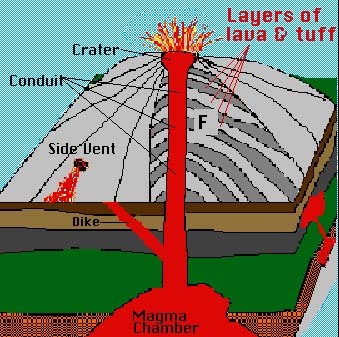 The materials that makes up the magma (gases, minerals, steam) determines how the magma will arrive at the surface. You will learn more about magma and lava in the next lesson "Lava Flows and Pyroclasts". The letter D represents a conduit . 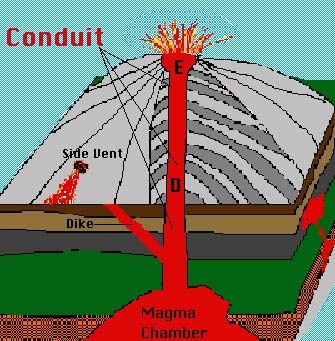 A conduit is the main tube or pathway for the magma to reach the surface. Devils Tower in Wyoming is an example of a cooled and hardened conduit. This is a photo of Devils Tower National Monument. 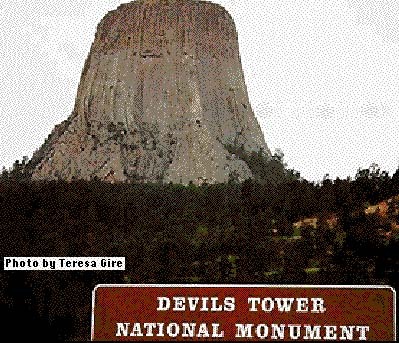 Devils Tower in Wyoming is an ancient conduit. The source for the magma moved and the magma in the conduit cooled and hardened into a very hard lava rock called basalt . The volcanic cone was made of softer volcanic materials probably ash and pumice that slowly eroded away leaving only the conduit standing. Today we know this ancient conduit as Devils Tower National Monument. 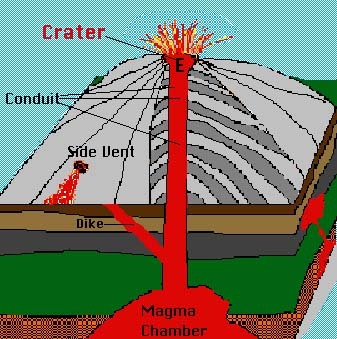 The letter E represents the crater and main vent of a volcano. 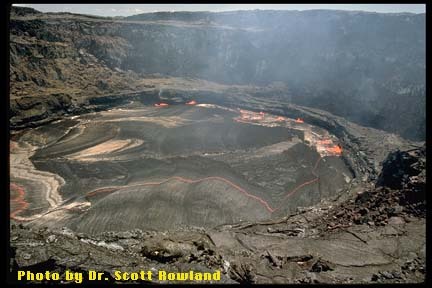 The crater is the bowl shaped opening located at the top of the volcano. The crater is also the steep sided walls made of hardened lava that surround the main vent. Lava can flow from the main vent, but not all volcanoes eject large amounts of lava. Some volcanoes explode molten rock and huge amounts of gas from the main vent. Volcanoes are not always erupting and the crater may be a bubbling caldron of lava without enough pressure to erupt. This photograph is of a volcanic cone. The crater is located at the top. 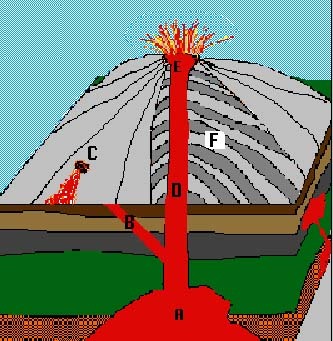 The side vent is active and a lava flow is running down the side of the cone. A fissure is bringing the magma to the side vent. This photo is courtesy of Dr. Scott Rowland of the University of Hawaii. You are looking at the inside of a volcanic crater. The steep walls were produced be many eruptions ejecting very liquid lava. This lava then lands on the crater walls building them higher and higher. The lava in the main vent is extremely hot (probably about 1800 degrees F.) The lava on top cools and hardens because the air that it is in contact with is so much cooler than the lava. This hardened lava will then be dragged back down under the surface and remelted. You probably noticed the same process if you have ever heated soup on the stove. If you did not keep stirring the soup it formed a "scum" on top. The letter F represents layers of tuff and lava. When a volcano erupts it may eject lava, lava rock and ash. 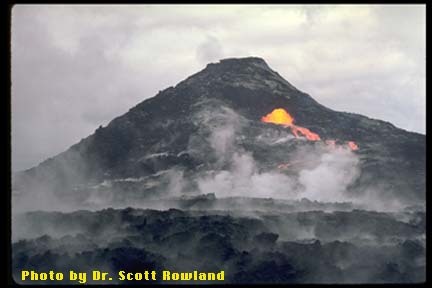 When stratovolcanoes are built some of the lava and ash lands and stays on the volcano building it higher and higher with each eruption. The ash hardens into a rock that is called tuff. Write your answers to the following questions on a sheet of paper.